Entitled “Al-Jiwar” (or “Neighbourhood”), Eman Hakim’s recent exhibition at the Art Corner Gallery in Zamalek (30 November-10 December) covers not the artist’s birthplace of Minya, one of Egypt’s most beautiful provinces, but Cairo’s human marginalia, as it were: male and female members of the urban working class. But instead of inspiring pity or sadness, these faces are infused with such brightness and power they fill you with positive energy. It is the artist’s passionate spirit coming through. Hakim graduated from Minya University’s Faculty of Fine Arts in 1989 – she studied interior design – after which she resumed her struggle with Minya’s conservative traditions to become an artist without antagonising her family. 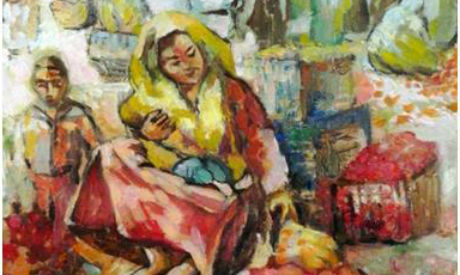 One of a handful of female Coptic painters, Hakim shows no religious inclination whatsoever in her paintings; instead there is a message of peace, a truly Christian unconditional love. Hakim says what she liked most about Minya was the peace and quiet. “Nature surrounded me everywhere: farms, the Nile, peasants and birds. However, the constraints imposed on girls bothered me a lot. As a child, Hakim spent 10 years in Dayrout, a place well-known for its vendettas. “The echoes of bullets and screams of terror still reverberate in my head.” And this might be the reason why she yearns for peaceful subjects. Reviewing her exhibitions over the last five years, one observes an inclination for depicting women in different environments and costumes. Simple and cheerful women are often celebrated in Hakim’s paintings; she draws on the rich seams of her memory of female peasants. “It is hard to find a model nowadays. One of my favourite models, however, is called Rania. She is the doorman’s daughter. She is a very beautiful and very clever girl, although she is illiterate and typically looks to become a housewife. This is Hakim’s ninth solo exhibition. Her first solo exhibition took place in 2006. In her previous exhibitions, Hakim used impressionist methods to paint, among other motifs, the peacock: her most frequent subject when she lived in Dubai: “In certain parts of the UAE peacocks just roam the streets. So I had the chance to watch them closely, feed them and make sketches.” A member of the Dubai International Art Centre and the Emirates Fine Art Society, the artist participated lately in the Financial Centre’s international exhibition with a collection of paintings entitled “She and the Peacock”. “As I read more about peacocks, I found out that the attitude of the male bird is just like the attitude of Arab men: showy, mannish, its optimum desire is to attract a large number of females. I tried to show these resemblances,” she noted with a big smile. But the peacock has little to do with the present exhibition, which shows a brave spirit and an eagerness to experiment. Here the texture is layered, stronger strokes of the knife creating a variable depth, with scars that tell you more about the psychological history of each portrait. There are 45 paintings in pastel, acrylic and oil, vibrant and expressive. One depicts a fruit and vegetable market on the way to Fayyoum. A female vendor is seated on the ground, offering her fruits to customers in an intimate way, bargaining or chatting softly while breastfeeding her baby. “I find beauty in such scenes, where the struggle for life takes place spontaneously and peacefully,” she commented. Another shows boats on the Nile, floating peacefully. But, even though she has not changed her palette of yellow, orange and blue, in almost every case artist uses a darker, colder range of hues: a gloomy outlook. In November 2016, the artist participated with one of her interesting paintings in an international exhibition entitled “Silk Road Pearl” in Tajikistan. The painting is 70 x 100 cm, entitled Enjoying the Peace. It features a young woman in a blue dress with a scarf over her hair, holding a pottery vase in her hands and sitting on a colourful couch. The background is also adorned with red roses. Although the painting looks overloaded with colour, there is a balance between hot and cold, a sense of contentment and peacefulness emanating from the girl and her joy in the small thing in her hands. Almost all her paintings depict silent immobile characters, except in market paintings, where the true pulse of a popular market is brilliantly depicted. Light penetrates the colourful umbrellas fixed over the wooden carets. Light is one of the key features in Hakim’s paintings, with daylight adding a cheerful spirit. The artist will participate in the new round of Art Dubai with new variations on the peacock theme.